shaved slow-roasted rare pork loin with peach-onion chutney and chevre, originally uploaded by aarn! +13th October, 2009+. made a brine base by heating 1-gal of water and dissolving into it 1c. kosher salt and 1/2c. sugar. seasoned the brine, while still slightly warm, with many springs of dill, 8-cloves of crushed garlic, a few cloves (4? ), and lots of fresh cracked pepper. placed the brine in a large non-reactive tub and chilled in the refrigerator. placed a 5-lb pork loin (strap-on) in the brine and let sit, covered and refrigerated, for 16-hours. removed the brine liquid from the tub containing the pork, and let the pork sit for 24-hours, covered in the refrigerator (to allow the salt concentration to normalize throughout the meat). in a mortar and pestle ground together a few cloves of garlic, 1.5t. smoked paprika (christina's spices), 1t. dry mustard powder, a dry tobasco pepper, salt and pepper, and 1T. canola oil. patted the pork loin dry and then covered the entire outside surface with the ground paste. placed the pork loin on a rack on a baking sheet in a 225-degree oven for 2 3/4-hours, until the internal temperature of the meat was around 130-degrees, then rested for an hour or so, “tasted” and then chilled. in a small sauce pan simmered 1/2 of a medium sized onion, thinly sliced, with a little canola oil, salt and pepper. added 1/2 of a large peach (about a 1:1 ratio of onion to peach), which had been cut into thin matchsticks, and about 1T. of molasses. simmered until the peach was softened, but still firm in the middle. 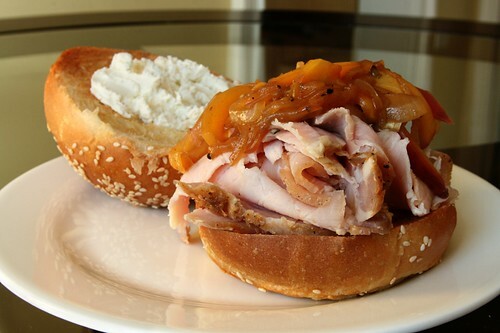 shaved the slow-roasted pork loin thinly and placed on a toasted sesame seed bulkie roll (hi-rise bakery), topped with the onion-peach chutney and a smear of chevre.